Welcome to the LibreCAD Wiki! 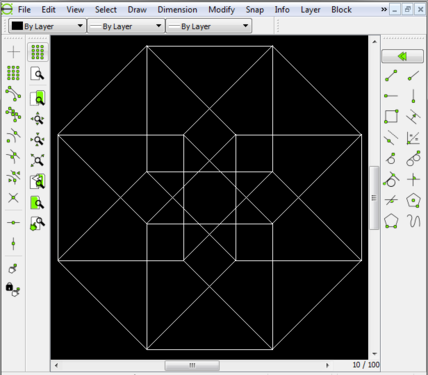 LibreCAD (originally CADuntu) is a free and open-source 2D CAD application, which uses Qt (a cross-platform application framework). The project started around 2010 as a fork of QCAD 2.0.5.0. Support for reading DWG files was added with libdxfrw. Support for writing MakerCAM SVG files was also added. The release of 2.1.0 increased customization of the user interface. You can now create custom toolbars and menus, and dramatically change the appearance (among other things). If you want to contribute to this wiki, please visit the LibreCAD Wiki:Community portal page. Content is available under Creative Commons Attribution Share Alike. If you wish you get involved in development, then head over to our GitHub repo and get started! If you think you've found a bug or have an idea for an improvement, then head over to the github issues page. If you have any questions or comments please visit our forum or chatroom on IRC at freenode.net. The latest stable release is 2.1.3. Contribute to the wiki based on your accumulated knowledge. If you have figured out a feature in LibreCAD, please add to our wiki to help other users. Implement more command line support for actions. Currently, there are many actions there without command line support, we need to complete this part of implementation and add the relevant documents. We have implemented new math support for hyperbola and parabola. Implementation support for hyperbola/parabola entities would make LibreCAD capable of doing all conic sections. You might also want to consider contributing to the next generation of LibreCAD. This page was last modified on 6 November 2018, at 11:19. This page has been accessed 2,032,761 times.